The recommended starting dose is 2 mg once daily. Do not exceed 4 mg once-daily dose. After 4 weeks, analyze lipid levels and adjust dosing accordingly. Patients with moderate and severe renal impairment not on hemodialysis (GFR 30-59 mL/min/1.73 m2 and 15-29 mL/min/1.73 m2, respectively) and patients with end-stage renal disease on hemodialysis should receive a starting dose of Zypitamag™ 1 mg once daily and a maximum dose of Zypitamag™ 2 mg once daily. 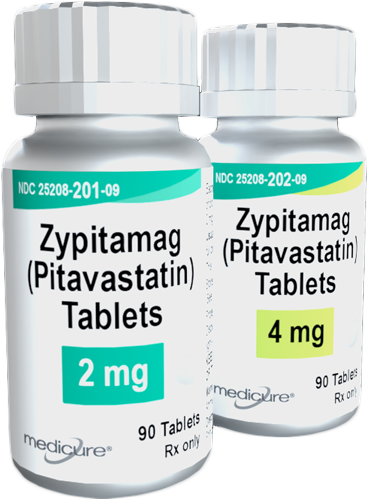 In patients taking erythromycin, a dose of Zypitamag™ 1 mg once daily should not be exceeded. In patients taking rifampin, a dose of Zypitamag™ 2 mg once daily should not be exceeded. Refer to Prescribing Information for complete dosing information and to the Important Safety Information for dose-dependent skeletal muscle effects. Assessing patients' individual risks: Evaluate age, comorbidities, and treatment regimens, including complexity, polypharmacy, and potential drug interactions. Determining treatment: Consider statins as first-line drug treatment. Selecting appropriate statin and dose: Discussion with patient to help minimize individual challenges to optimize goal achievement. Pitavastatin (2 mg, 4 mg) is recommended as a moderate intensity statin. Patient candidates may exist for high-intensity statin but may meet the need for moderate-intensity statin based on the following intensity-modifying criteria.